The instructions below are for both Oriental and Asiatic lilies, which are suitable for forcing for the Easter and Mother's Day holidays. take longer to force in the greenhouse than Asiatic lilies. Asiatic lilies are shipped based on when Easter falls that year. Plant lilies deep in 6 inch standard pots. They need to make stem roots for a healthy growing plant. The ideal PH level of the soil is 6.3. 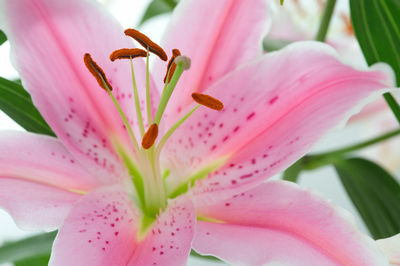 Start lilies off for the first two weeks between 55 and 60 degrees, then raise the temperature to 65 degrees. After lilies have broken the soil line, the temperature can be increased to 68 degrees. Once lilies break the soil line, start feeding lilies 250 PPM (125 PPM Potassium Nitrate and 125 PPM Calcium Nitrate.) Feed only when growing medium is dry. Every time you water, use this combination of fertilizer. Since these lilies are grown during the winter months additional lighting is required. Once lilies break the soil line, place a string of lights over the top. Growers should give both Oriental and Asiatic lilies a minimum of 16 hours of light per day. If lilies do not receive adequate lighting during the forcing period, poor quality lilies will result by flower buds aborting and falling off the stem. 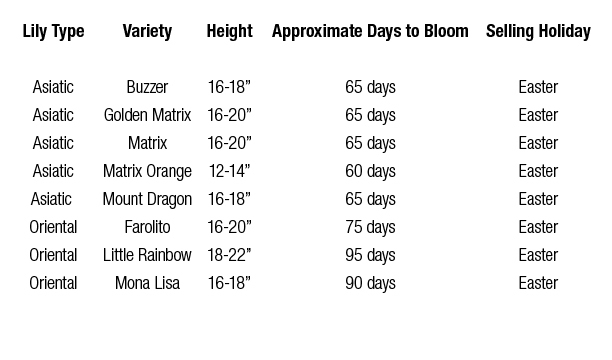 The following is a list of recommended varieties, their height, recommended plant week and days to bloom. Ultimate bloom time will always be dependent on consistency of light and temperature during growing period.